96. Enabling direct laser writing of cellulose-based submicron architectures. 95. Structures of mixed-tacticity polyhydroxybutyrates. 94. Lignin/chitin films and their absorption characteristics for heavy metal ions. 93. Cellulose and chitin composite materials from an ionic liquid and a green co-solvent. 92. Dataset on the structural characterization of organosolv lignin obtained from ensiled Poaceae grass and load-dependent molecular weight changes during thermoplastic processing. 91. Effects of high-lignin-loading on thermal, mechanical, and morphological properties of composites containing lignin derived from ensiled grass and poly(ethylene-co-vinyl acetate) rubber. 90. A perspective on bio-mediated materials syntheses. 89. Towards a new generation of smart biomimetic actuators for architecture. 86. Preparation of magnesium oxide and magnesium silicate replicas retaining the hierarchical structure of pine wood. 85. Biomimetics: From its theoretical understanding to its practical use. 84. Nanocellulosic fillers for waterborne wood coatings: reinforcement effect in free-standing coating films. Wood Science and Technology, 51, 601-613. 83. Biomimetics: Process, tools & practice. 82. Cellulose acetate based composites with antimicrobial properties from embedded molybdenum trioxide particles. 81. Passive and active mechanical properties of biotemplated ceramics revisited. Van Opdenbosch D, Fritz-Popovski G, Plank J, Zollfrank C & Paris O.
Bioinspiration & Biomimetics 11(6), 65001 (2016). 80. Biomimetic Random Lasers with Tunable Spatial and Temporal Coherence. Ghofraniha N, La Volpe L, Van Opdenbosch D, Zollfrank C & Conti C.
Advanced Optical Materials Early View (2016). 79. Integrated biorefinery concept for grass silage using a combination of adapted pulping methods for advanced saccharification and extraction of lignin. 78. Moisture-driven ceramic bilayer actuators from a biotemplating approach. 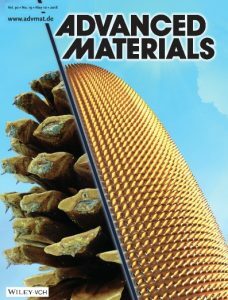 Advanced Materials 28(26), 5235–5240 (2016). 77. Dry, hydrophobic microfibrillated cellulose powder for polymer reinforcement obtained in a simple procedure using alkyl ketene dimer. 76. Enhancement of the antimicrobial properties of orthorhombic molybdenum trioxide by fracturing hydrates. 75. Bio-inspired functional wood-based materials – hybrids and replicates. 74. A SEM record of proteins-derived microcellular silicon carbide foams. 73. Pore characteristics and mechanical properties of silica templated by wood. 72. Herstellung anorganischer Struktur- und Funktionsmaterialien – Biogene Polymere als Template. 70. Innovative Development in Antimicrobial Materials. 69. Bioinspired Materials Surfaces – Science or Engineering? 68. Anisotropic photoluminescent properties of biomorphic Al2O3 coated with ZnO tetrapods. 67. Polymorphs of molybdenum trioxide as innovative antimicrobial materials. 66. Synthesis of Eu-doped SrAl2O4 nanophosphors by CO2 laser vaporization. 65. Recent advances on the nanoscale replication of biological tissues. 64. Chemistry and water-repelling properties of phenyl-incorporating wood composites. 63. Preparation of CaCO3 and CaO replica retaining the hierarchical and mesoporous structure of spruce wood. 62. Künstliche Versteinerung von Holz. 61. Synthesis of titanium(IV) oxide / molybdenum(VI) oxide based photocatalysts by a simple sol gel route. 60. Structure and oxidation resistance of novel Si-SiC composite foams derived from natural resins. 59. A novel concept for self-reporting materials: Stress sensitive photoluminescence in ZnO tetrapod filled elastomers. 58. Development of the fibrillar and microfibrillar structure during biomimetic mineralization of wood. 57. Electron microscopical and micro-mechanical techniques give direct evidence of a close structure-property relationship in tension wood of poplar. 56. Mineralization of calcium carbonates in cellulose gel membranes. 55. Fabrication of high-temperature resistant three dimensional photonic crystals with tunable photonic properties by biotemplating. 54. The pomelo peel and derived nanoreplica silica gradient foams. 53. Noble metal nanoparticles on biotemplated nanowires. 52. Bioinspired materials: An emerging field of multidisciplinary research (editorial). 51. Biotemplating of inorganic functional materials from polysaccharides. 50. The antimicrobial activity of transition metal acid MoO3 prevents microbial growth on material surfaces. 49. Transparent cellulose sheets as synthesis matrices for inorganic functional particles. 48. Cellulose-biotemplated silica nanowires coated with a dense gold nanoparticle layer. 47. Silica replication of the hierarchical structure of wood with nanometer precision. 46. Anodic TiO2 nanotube layers electrochemically filled with MoO3 and their antimicrobial properties. 45. Carbon auto-doping improves the photocatalytic properties of biotemplated ceramics. 44. The effect of SiC substrate microstructure and impurities on the phase formation in carbide-derived carbon. 43. 3D printing of Al2O3/Cu-O interpenetrating phase composite. 42. Fabrication of silicon carbide micropillar arrays from polycarbosilanes. 41. Replication of wood biomorphous nanocrystalline Y2O3:Eu3+ phosphor materials. 40. Molecular and supramolecular templating of silica-based nanotubes and introduction of metal nanowires (Feature article). 39. Micromechanics and ultrastructure of pyrolysed softwood cell walls. 38. SiC ceramic micropatterns from polycarbosilanes. 37. Biotemplating: Polysaccharides in materials engineering. 36. Biotemplating of BaFBr:Eu2+ for X-ray storage phosphor applications. 35. Biomorphe Keramik: Technologie nach dem Vorbild der Natur. 34. Nitrogen-substituted TiO2: Investigation on the photocatalytic activity in the visible light range. 33. Ferroelectric lead titanate nanotubes by conversion of anodic TiO2 nanotubes. 32. Effect of transition metal catalysts on the microstructure of carbide derived carbon (CDC). 31. Origin of broad NIR emission from bismuthate glass and Bi-doped glasses at room temperature. 30. Luminescent silica nanotubes and nanowires: Preparation from cellulose whisker templates and investigation of irradiation-induced luminescence. 29. Bioinspired design of SrAl2O4:Eu phosphors. 28. Ultrastructural investigation of the softwood cell during pyrolysis. 27. Europium(III) phosphate: synthesis, characterization and optical properties. 26. Enzyme-catalysed synthesis of calcium phosphates. 25. Spatially resolved luminescence properties of micro-sized ZnO tetrapods. 24. Regioselective manufacturing of silica nanotubes by molecular templating. 23. Biomimetic mineralisation of apatites on Ca2+ activated cellulose templates. 20. Microstructure of alumina reinforced with tungsten carbide. 19. Inherent luminescence of annealed biomimetic apatites. 18. Preparation of bioactive cellulose/hydroxyapatite composite tapes. 17. Photoluminescence of annealed biomimetic apatites. 16. Biomorphous SiSiC/Al-Si ceramic composites manufactured by squeeze casting: microstructure and mechanical properties. 15. Microstructure evolution and reaction mechanism of biomorphous SiSiC-ceramics. 14. A comprehensive study of softwood pyrolysis: Cellulose decomposition and carbon formation during pyrolysis of softwood. 13. Photoluminescence of biomimetically derived apatites. 12. Microstructure and phase morphology of wood derived biomorphous SiSiC-ceramics. 11. Biomorphous SiOC/C ceramic composites from chemically modified wood templates. 10. Microstructure and mechanical properties of WC-Co reinforced with NbC. 9. Biomimetic apatite formation on chemically modified cellulosic templates. 8. Gas phase processing of porous, biomorphous TiC-ceramics. 7. Processing of SiSiC-ceramics biocarbon powder preforms. 6. FTIR microscopy and ultrastructural investigation of silylated solid wood. 5. Manufacturing of Biomorphic SiC-Ceramics by Gas Phase Infiltration of Wood. 4. Manufacturing of Anisotropic Ceramics from Preceramic Polymer infiltrated Wood. 3. Silylation of solid beech wood. 2. Zur Struktur von Cellulose-II-Einkristallen aus verdünnter Kupfer(II)ethylendiamin-Lösung. 1. Cellulose-II single crystals from dilute copper-(II)-diethylendiamine solution.